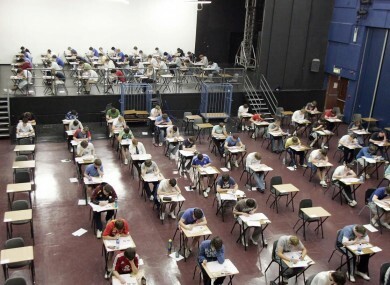 ALMOST 1,000 STUDENTS due to sit Leaving Cert exams in 2014 were denied support measures from the Department of Education, newly released figures from the State Examinations Commission show. The students, who have a range of special needs, applied through the Commission for a reader to assist them during their exams, so they would be able to answer the questions to the best of their ability. Campaign group Ahead, which works to promote greater access to education for students with disabilities, says it’s a problem cropping up “year on year” – and that, in some cases, people are only getting notice that their application has been turned down days before their exams start. Figures provided by the SEC to Fianna Fáil’s Seán Fleming showed that 669 students had applications for a reader rejected in 2012. The corresponding figure for 2013 was 894, and the figure rose to 914 last year. “I am sure the figure this year is the same as last year at least,” Fleming said – blaming cutbacks imposed by the Department of Education. The number of students applying for the special measures increased only slightly between 2012 and 2014 – from 2,495 to 2,609. Readers are typically provided to students suffering with dyslexia, dyspraxia and other special needs – and Ahead’s Anne Heelan said many young people with “hidden disabilities” were being discriminated against by the system. The fact that many students only received a rejection notice days before the start of the examinations only added to the problem, she said – exacerbating the stress they were already under as a result of the exam process. “In the case of the leaving certificate, all applications for reasonable accommodations on grounds of specific learning difficulties are referred to the National Educational Psychological Service, NEPS, for consideration,” junior minister at the Department of Education Damien English said, replying to Fleming’s questions on the issue. Applications for readers, he explained, “must show evidence of a specific learning difficulty and must be accompanied by supporting information which will allow NEPS to make an assessment of the applicant’s degree of reading difficulty”. The NEPS assessment of eligibility for the purposes of the RACE [Reasonable Accommodations at the Certificate Examinations] scheme is made on the basis of all of the information available and as required, in consultation with the school concerned. The process is carried entirely independently, English said. He noted, however, that the percentage of students being turned down for special assistance had “changed a lot” and added “I will research that data further”. Read: What did a Leaving Cert exam paper look like 80 years ago? Email “Students with special needs being denied supports "days before exams"”. Feedback on “Students with special needs being denied supports "days before exams"”.